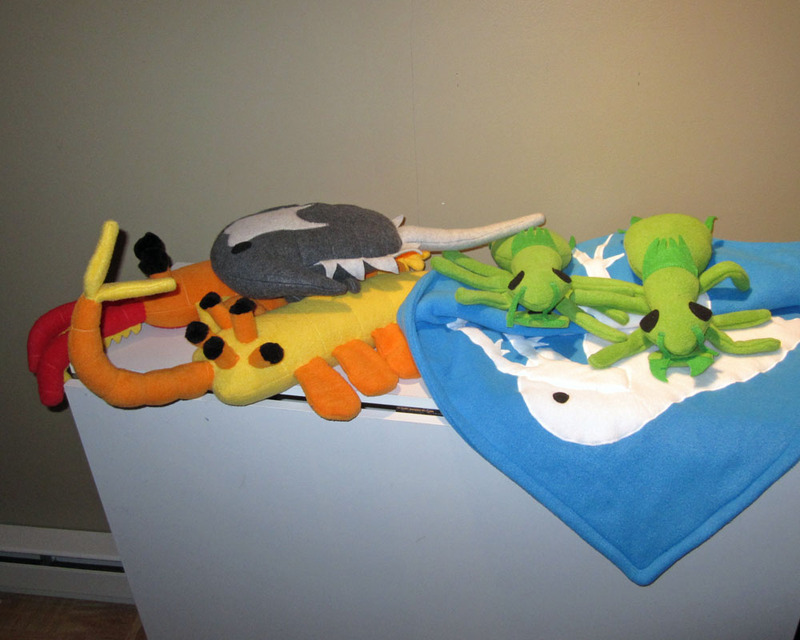 Anomalocaris, Opabinia, Euproops, two odonate nymphs, and a baby blanket with a copepod and daphnia on it. In progress are two tardigrades, and I have a long list of custom order requests still to confront. And I managed to do some schoolwork and illustration practice, ran a 5K for crossfit, shopping (I needed some knee high socks for weight lifting), cooking, cleaning, feeding and playing with the animals – it’s amazing what I can accomplish when my boyfriend goes away for the weekend. I really love the stories behind the orders I receive (the baby blanket was a hoot!). It is gratifying to know I am able to bring such joy to others, and to know that there are lots of other biology geeks out there. Especially since I can balance my business with the rest of my life. I will have to slow down the sewing once my teaching responsibilities and research become more demanding, but for now – any spare moment is spent with my drawing pens or my sewing machine. Once I catch up on custom orders, I really want to make more caterpillars. I’ll start taking suggestions on species!